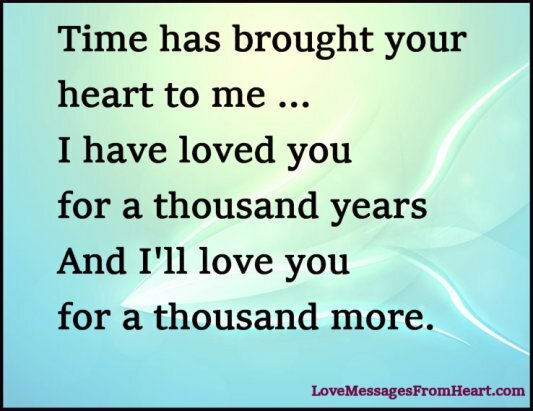 Time has brought your heart to me … I have loved you for a thousand years and I’ll love you for a thousand more. There are moments in my life that I will always remember, not because they were so important, but because you were there. I love you the way a drowning man loves air, the way the driest desert welcomes drops of water. Every heart sings a song, but it’s incomplete until another heart whispers back. Yours did and now we sing the same song. It was love at first sight … and at every sight since and forever. You quietly slipped under my skin, then you entered my blood and seized my heart. Sometimes I can’t see myself when I’m with you. I can only see you …. you are my world. My feelings can not be repressed any longer. I have to tell you how ardently I admire and love you. I saw angels in the sky, I saw unicorns dancing in the meadow. I saw things you only imagine to see or do, but I still haven’t seen anything sweeter than you! Before you, my life was like a moonless night. Very dark. And then you shot across my sky like a meteor. Suddenly everything was on fire; there was brilliancy, there was beauty. I love each and every once in a lifetime moments I share with you … today, tomorrow, forever.